Archbold, OH – Sauder Village, Ohio’s largest living-history destination, will open on Tuesday, May 2 with a focus on farming, gardening and new themed activities throughout the year. The 41st Annual Quilt Show will also kick-off the season with a spectacular display of quilts in Founder’s Hall, a new vendor market, quilting demonstrations, workshops and more! From its very beginning, Sauder Village has been centered around sharing experiences rich in history, hospitality, creativity and fun. New this year, guests can enjoy themed experiences throughout the season with an increased emphasis on farming and gardening. To start the season, daily activities will encourage guests to “discover” the power of water, how to milk a goat, the power of wind, how to give a horse a bath and much more! Guests can view a calendar on the Sauder Village website to learn more about the special activities planned each day in the Historic Village. From quilts, dolls and barbershop music to vintage base ball, apple butter and farm days . . . . the 2017 season is also filled with many unique special events. To start the season the 41st annual Quilt Show will take place from May 2 – 7 with hundreds of quilts on display in Founder’s Hall. This extraordinary event celebrates the rich tradition of quilting while showcasing the fine craftsmanship of quilters from throughout the Midwest. This year’s event includes great shopping at Threads of Tradition Quilt Shop as well as a new “Vendor Market” in the Museum Building that will include quilting supplies from a number of quilt shops! The show will also feature special exhibits, quilting demonstrations, quilt appraisals and workshops with guest artists Mary Kerr and Lenore Crawford. Other upcoming events include Spring on the Farm on Saturday, May 13 and the popular Antique Car Gathering on Saturday, May 20. Sauder Village offers plenty for guests to see and do while visiting historic homes, farms, gardens and community shops. 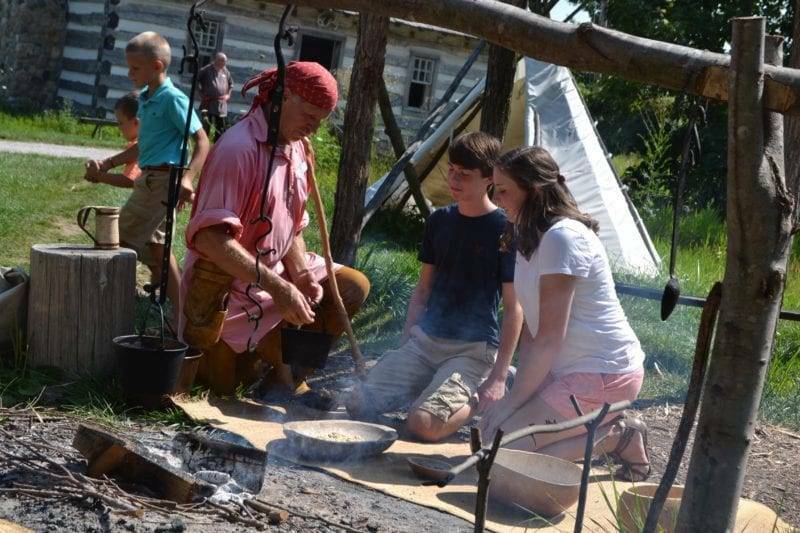 Families can take a walk through time while exploring wigwams and a trading post at Natives & Newcomers and continue to the Pioneer Settlement Area to experience life in Ohio from 1830-1870 at the log school, church, barn, homes and gardens. Finally, guests can step into the 1920s at the Grime Homestead complete with telephone, radio and player piano. Throughout the Village guests can also marvel at craftsmen blending skill and creativity in glass, metals, fabric, wood and clay. Every day traditional and contemporary craftsmen not only demonstrate their trade but also offer hand-crafted items available for sale in places like the Spinning Shop, Pottery Shop, Weaving Shop, Glass Shop, Blacksmith Shop and Tiffin River Woodworks. A ride on the horse-drawn carriage and a trip around the Village on the Erie Express Train are also popular activities. The Barn Restaurant offers a unique place to enjoy a home-style meal and guests can always find delicious treats to take home from Stella Leona Chocolates & Coffees and the Doughbox Bakery. For those looking to extend their stay, overnight accommodations and special packages are available at the Sauder Heritage Inn and the 87-site Sauder Village Campground. Historic Sauder Village is open this spring Tuesday through Friday from 10:00 a.m. – 3:30 p.m., Saturday from 10:00 a.m. – 5:00 p.m. and Sunday from noon-4:00 p.m. The Village is closed on Mondays, except holidays and summer hours will begin after Memorial Day. Admission is $17.00 for adults, $11.00 for students (6-16) and free for members and children 5 and under. Again this year, children 16 and under are free every Sunday this season! Sauder Village Memberships offer many valuable benefits and are available for only $50 for a Single, $75 for a Couple or $85 for a Family/Grandparent Membership. For more details about planning a memorable Sauder Village get-away call 800.590.9755, visit the Sauder Village website at www.saudervillage.org, like us on Facebook or follow us on Twitter and Instagram. Be the first to comment on "Sauder Village Opening May 2 for 2017 Season"